As part of our bike plan update, we conducted a survey about biking in Oakland. The survey was random so that we could hear from people who bike, but also people who don't. We provided respondents with a code to take the survey online. Respondents could also request a paper copy by mail and a version in English, Spanish, or Chinese. We collected 1,688 responses citywide! Then, we weighted the final results to make sure we were reflecting city demographics. Is disconnected. 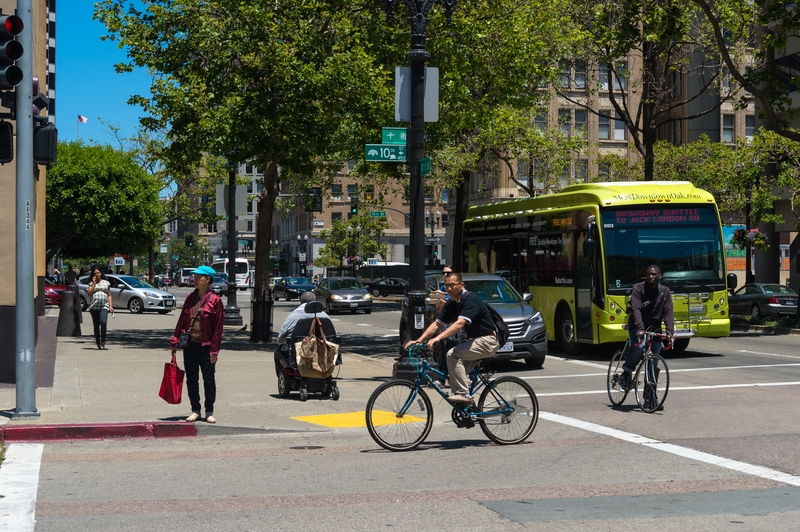 Just 14% of Oakland's streets have designated bicycle facilities, only 6% have bike routes that aren't stressful for most people ("low stress routes"), and many of these routes don’t connect to other low stress routes. Can be stressful. 79% of Oaklanders said aggressive drivers are a major concern, and 70% are concerned about getting their bike stolen. Dodging potholes is a problem, too--71% of Oaklanders said the streets in their neighborhood have potholes and are badly in need of repairs. Is not equally distributed. Most of Oakland's low stress routes are in Downtown, North Oakland/Adams Point, and West Oakland. Around 2% of streets in Central/East Oakland are low stress routes, compared to 25% of Downtown streets. People want to bike more. Across the flats, most people (61-72%) said they’d like to bike more than they do now. Most Oaklanders feel biking would reduce the amount of money they spend on transportation (72%) and that their neighborhood would be a better place if more people rode bicycles (51%). Oakland is a suitable place to bike. Oakland is mostly flat, we have great weather, and our street network is a grid in the areas where most people live and where education and community centers, jobs, grocery stores and connections to transit are concentrated. Good design works. While only 5% of Oaklanders feel comfortable biking on roads without bike lanes, 67% feel comfortable biking on roads with separated bike lanes. Our final quick takeaway: There are more people biking in Oakland than we previously thought! From the Census, which asks about trips to and from work, we thought around 3% of Oaklanders bike. But we found that actually 20% of Oaklanders regularly bike for transportation. Truly, there’s more to life than work, and whether it's trips to the grocery store, to meet friends and family, or for errands, biking is a common, everyday Oakland thing. For more analysis, with graphics, check out our existing conditions slides.